made this season. They were made last week. 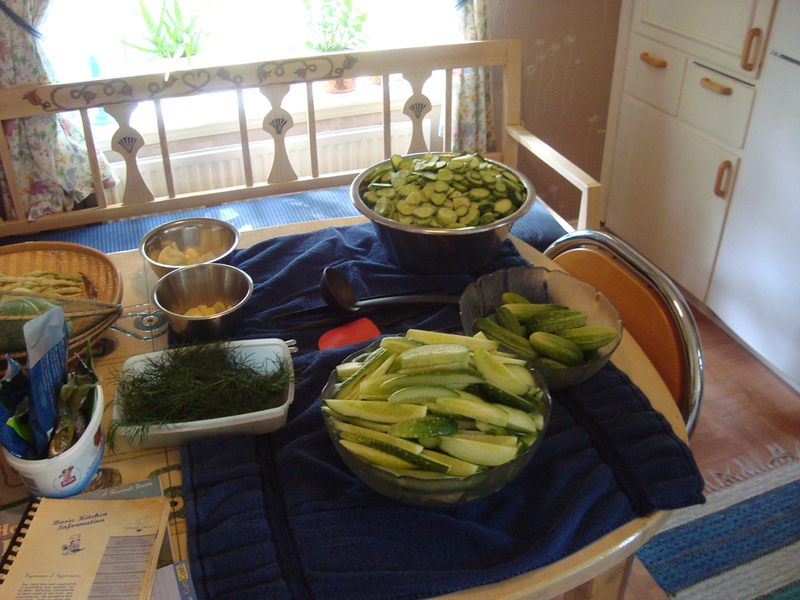 These cucumbers have been cut in sandwich thin wafers, whole gherkin size and pickle slices. We like the variety. We use a cheese cutter to make thin wafer slices. I stack everything I need to make it an assembly line process. The pickling juice is boiling on the stove. Jars are soaking in boiling water. The towels are laid down to keep the hot jars from breaking,because of cooling too fast. 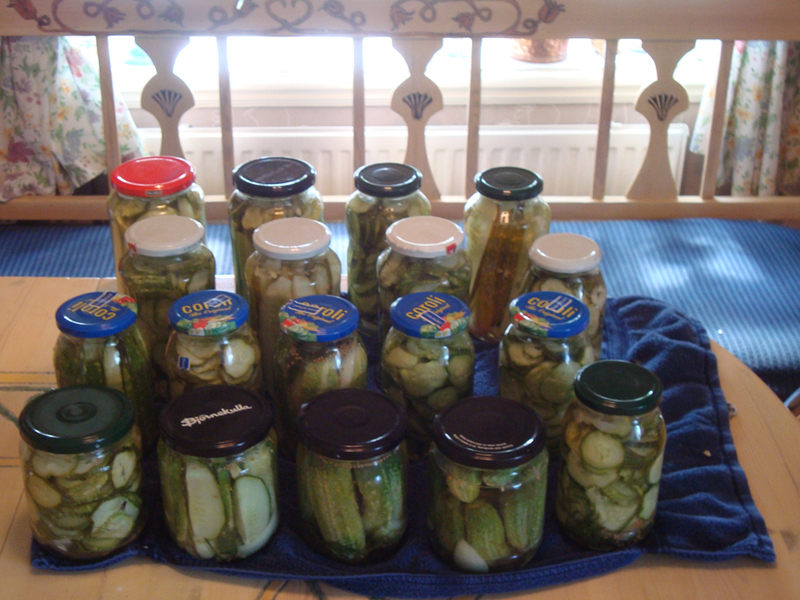 This is a triple recipe batch, that made this many jars of pickles. I just need to label them, with date and batch number. Hubby will carry them down stair into the cellar after the lids have popped and they are cooled. I kinda mix it up when I slice them. Some I slice very thin and some I slice thick slivers. 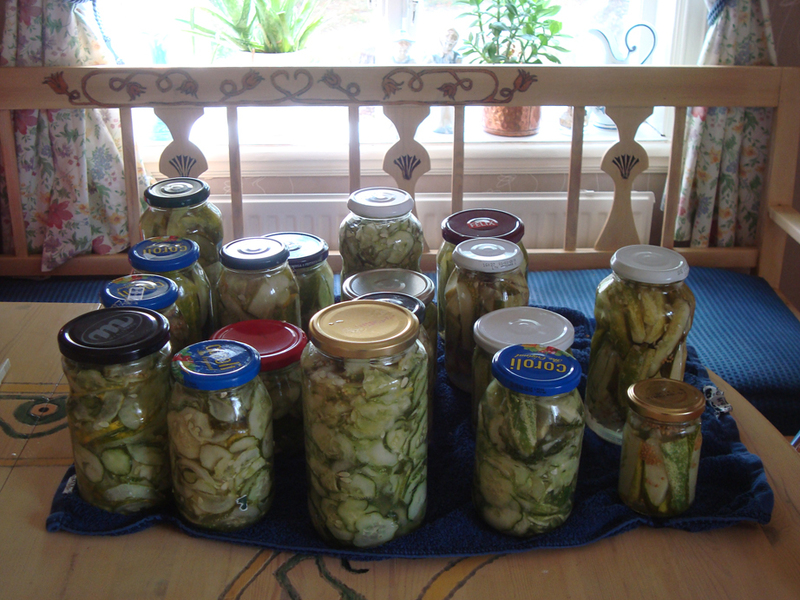 I leave the gherkin size cucumber whole and pickle them as they are. The thin sliced ones will be ready to eat in only 24 hours and I give the thick ones at least a week.Next get your onions cut into chunky pieces and set aside. Another tip is that I add all the ingredients below in the jar before I had the cucumbers. Now fill (pack) mustard seeds, dill, bay leaf and onions into the jars and then pack the cucumbers in and the pour in pickling mixture. Pack the jars as tightly as you can. Leave an empty space at the top of the jar so the pickles nor mixture don’t touch the lid. Wipe down jars and put lids on. Do not allow jars to touch each other, while cooling.You will hear the lids pop as they cool which means they have sealed properly.Allow them to cool for several hours before storage.